The Scotland flanker says Ireland will be like a wounded animal in the Murrayfield clash. 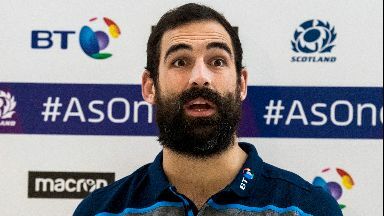 Josh Strauss has said that Scotland will have to step up a level against Ireland this weekend but can earn a positive result if they take a leaf out of England's book. Eddie Jones' side were 32-20 winners in Dublin on the opening weekend and Strauss believes matching that performance can be key to success. Scotland lost 28-8 to Ireland at the Aviva last year and the flanker said that the team would look to learn from that defeat. While he felt home advantage could help, and was eagerly anticipating the Murrayfield backing, he said that feeling wouldn't kick in until Saturday and until then preparation was his main focus. "Last year I wasn't involved but watching that game, building up to this game, watching a lot of the clips on things we did well and things we can do better," Strauss said. "Physically we did match them as a team last year but also in 2017 in that game we fronted up very well physically and we've got to take another step this week. "We've seen what England have done so if you match that you probably get something out of it. "You can only do as much as you can. You try take the best things from our performances and build on that. "Like last weekend in the last ten minutes we slipped up, we need to nip that in the bud and get better. "It might sound cliché but we just focus on the week and on yourself. I think a lot of teams are trying to get away from if you are home or away, that comes later in the week when you start talking about a few mental things. "Earlier in the week it's more preparation wise, new plays, new calls, and then later on in the week the mental side starts to come in and you talk about 'this is home, we don't lose at home'. It's sold out. "It's a great feeling singing the national anthem with a full stadium. It does boost us knowing it's going to be there. Sometimes you go with your club and you know it won't be full, it's not like that. You get there and you know it's going to be full and the people will be behind you and it's a great feeling." Strauss said that defeat to England would only make Ireland more dangerous, with the players determined to make amends. "They have got great leaders in the team," he said. "They have some of the best players in the world and have been one of the best teams in the world over the past few seasons. "That will be their chat this week, showing that character, after coming off a bad loss, maybe something they didn't expect from England. This is the marker they've got to set now. Get better, win this game and then take it from there. "We'll have a big challenge on our hands, they will come as a wounded animal. It's away from home, they know how big it is playing at Murrayfield. We know what's coming. They'll know what's coming. We want to improve on things like the last ten minutes (Italy game)." Despite the wobbly ending, victory over Italy kept Scottish hopes of a successful tournament high. A win at Murrayfield would send expectation higher but also put Ireland in a difficult spot. "This will be their marker to put down," Strauss said. "If [Ireland] lose this one, probably that makes it very tough for them to get anywhere close to winning the competition. It's a tough dynamic because you want to focus on every week as it comes. "I don't think them as a team want to look at the end of the competition. They want to look at this week, how they will beat us and we're doing the same thing. I think it will be a good test. "They'll be really up for it and we have to match them."